In the last 9 months the Undervalued Screen has outperformed the S&P 500 by 21.2% while the Overvalued underperformed by -7.2%. The absolute numbers were +33.8% vs +5.4%. Stay tuned for the a look at what Sectors, Industries and equities contributed to the divergent returns. The graphs below show the performance of the two screens since inception on September 30th 2004. Relative to the Corequity universe, the respective annualized returns are +2.68% pa vs -3.77% for a spread of over 600 basis points per annum. The average return on the Universe is +2.04% pa which is more in line with the Equal Weighted S&P 500. Here is a look at the returns over the last year as well as since inception. This entry was posted in Equity Valuation, Performance and tagged Equity Valuation on April 3, 2017 by robertlcolbygmailcom. Share buybacks are a poor asset allocation decision. Buybacks reward share sellers not shareholders. Buybacks can’t compete with investment returns. Conclusion: From the shareholders’ perspective, most stock buybacks produce little benefit when compared to investing the same funds in the company. They produce a one-time gain in earnings per share (usually small) but contribute nothing to the growth of the net profit or market capitalization. If a company is truly unable to successfully invest the buyback funds in its business, it would be much better for the majority of shareholders to receive a special dividend. For the twelve months ending September 2016, total share buybacks were close to $600 billion for the S&P 500 companies. This is an enormous amount of money being 66% of the earnings and only slightly less than fixed capital expenditures in the same period. The average buyback program resulted in a “buyback yield” just shy of 3%. This resulted in a very modest annual decline in the shares outstanding which led to an equally modest one-time gain in earnings per share for shareholders, i.e. the vast majority who did not sell their shares. Because buybacks and dividend yield are considered to be returns to the shareholder, they tend to be lumped together in statements like “total shareholder yield is currently close to 5% comprised of a 2% dividend yield and a 3% buyback yield”. “Buyback yield” is very misleading. As the source of funds for buybacks is operating cash, it should be first and foremost compared to what they would have achieved if invested. A 3% “buyback yield” is greatly inferior to investing in the company’s business, acquisitions, or even a special dividend, which would be shared by all shareholders in hard dollars as opposed to soft dollar benefits attributable to fewer shares. This entry was posted in Buybacks and tagged Buybacks, Equity Valuation, INDUSTRY ANALYSIS on February 28, 2017 by robertlcolbygmailcom. 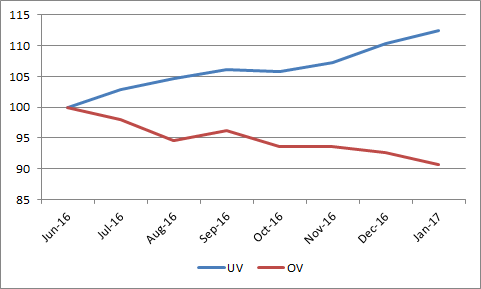 January adds another 4 % to the spread between the Undervalued (UV) and Overvalued (OV) screens performance since 6/30/16. This chart shows the relative performance to the average of our universe. Here are summary tables showing which Sectors contributed to the superior performance of the Undervalued and the poor performance of the Overvalued. The methodology is to add up the cumulative monthly Relative Strength of the screened equities by company, industry and sector and rank the Sectors (in this case) by the total contribution to their performance over the period. This entry was posted in Performance on February 9, 2017 by robertlcolbygmailcom. Conclusion: From the Shareholders perspective most Stock Buybacks produce little benefit when compared to investing the same funds in the company. They produce a onetime gain in Earnings per Share (usually small) but contribute nothing to the growth of the Net Profit or Market Capitalization. If a company is truly unable to successfully invest the Buyback funds in its business, it would be much better for the majority of shareholders to receive a Special Dividend. For the twelve months ending September 2016, total share buybacks were close to $600 billion for the S&P 500 companies. This is an enormous amount of money being 66% of the earnings and only slightly less than Fixed Capital Expenditures in the same period. The average buyback program resulted in a “buyback yield” of just shy of 3%  . This resulted in a very modest annual decline in the shares outstanding which led to an equally modest one time gain in Earnings per Share for the Shareholders, i.e. the vast majority who did not sell their shares. Because Buybacks and Dividend Yield are considered to be returns to the Shareholder they tend to be lumped together in statements like the “Total Shareholder Yield is currently close to 5% comprised of a 2% dividend yield and a 3% buyback yield”. A 3% “buyback yield” is greatly inferior to investing in the company’s business, acquisitions, or even a Special Dividend which would be shared by all Shareholders in hard dollars as opposed the soft dollar benefit attributable to fewer shares. The share purchase of 3% of the float produces a 3.5% pop in the EPS on day one. Annualized that is 3.5% in the first year, 1.7% per annum in the second and so on declining each year. By the second year, the Investment produces a higher return. By year 8, the Investment led to a Net Profit of $985m which is almost double the first year’s investment while the Buyback produced zero contribution to Net Profit. Were the stock price reduced by half and the Buyback amount kept the same you would get the following result. The original gain in EPS is increased to 7% but it soon pales by comparison to the Investment. Using the original price of $15 and twice the buyback funds ($1,000m), the result would be the same as in the previous example but the dollar gain in the Net Profit from Investing would double as twice the funds were used. These hypothetical examples illustrate the mechanics of stock buybacks. Now let us look at two actual examples. The first is Apple as it is listed as the most aggressive in terms of dollar amount of funds spent on buybacks in the last 12 months. Despite Apple having spent the over $30 billion, it confirms the disadvantages of Buybacks compared to Investments. In this case we used the average Return on Capital that they earned from 2009-15. Now let us look at one of the most aggressive buyback programs in terms of the percentage of stock that was bought. Corning Inc. purchased over 20% of their outstanding shares in the last 12 months  which produces an initial gain of 27% in EPS on day one. However, even this aggressive program fails by beat the Investment after year three even though Corning’s Return on Capital is only averages at 10.3% over the 7 years. This illustrates that even massive amounts of buybacks can’t change the fundamental disadvantage compared to investing. One of the reasons that investors are not more critical of management for stock buyback programs may be because, by doing it year after year, it creates the illusion that it is compounding. As shown here, each year’s transactions is still the equivalent of getting simple interest. What is the Required Rate of return on an Investment of the funds, that would grow the Net Profit at the same rate that the EPS grew due to fewer shares. Like Apple, the answer is surprisingly low in most instances. We analyzed 30 stocks whose buyback programs resulted in a median decline of 25% of their outstanding shares from 2008 to 2015. The median Required Return would have been only 4.9%. The median growth rate for their EPS was 7.7% pa while the Net Profit grew only at 2.4%. Instead, by investing at less than 5%, the Net Profit would have been 42% higher in the 7th year. Over the seven years the cumulative gain in Net Profit would have been 1.8x the original investment. It makes no sense to put the growth of Earnings per Share ahead of the growth of Net Profit and as a result, the growth of the Market Capitalization. 1.Factset Buyback Quarterly December 19, 2016. Defined as the buyback funds divided by the market capitalization. This entry was posted in Buybacks and tagged Buybacks, Equity Valuation, INDUSTRY ANALYSIS, NET PROFIT TEST, OVERVALUED STOCKS, SECTOR ANALYSIS, STOCK BUYBACKS, TOTAL SHAREHOLDER RETURN, UNDERVALUED STOCKS on February 7, 2017 by robertlcolbygmailcom. The objective of COREQUITY ANALYSIS is to determine the intrinsic value of an equity in the context of the company’s earnings characteristics. Equity performance has three components which are 1) dividend yield, 2) growth, and 3) change in valuation. In order to project the third component, it is necessary to measure the combined return from the first two. Growth (RR) is calculated from the normalized earnings which are reinvested in the company, divided by the book value. When added to the Dividend Yield (YLD), the two comprise the Inherent Return (IR). This is the total return to the shareholder if the price-to-earnings ratio remains constant. However, equity P/E’s are continuously being revalued – often in response to changes in institutional investors’ shared opinions of the future prospects. As the growth rate has a major influence on the P/E ratio, it is highly desirable to use a measure of value that relates the price-to-earnings ratio to the return provided from growth and yield. Payback (PB) provides such a measure. It is defined as the number of years to payback the stock price from the earnings which are growing at a rate equal to the Inherent Return less inflation. Once the Payback is calculated, its current applicability to the equity must be evaluated. By comparing the stock’s payback to the market’s Payback over time, a normal valuation range is derived for each individual equity for comparison to its current relative value. It can thus be shown that companies that consistently sell at a premium are good values at a small premium, while others can be fully priced at a discount. This relative valuation range is used to project a projected price range. The Valuation Risk, or Return (VR) is the percentage difference between the current price and the average of the projected range. FY. The FISCAL QUARTER for which the data is presented., YEAR indicates the actual year. ET. The Earnings Type. 1 is as is, 2 = Smoothed earnings, 3 = Smoothed earnings using a 2 year moving average, etc. VR. VALUATION RISK (-) or VALUATION RETURN (+). VR is the percentage price change that would occur if the stock price were equal to its intrinsic investment value which is defined as the average of the projected prices. RR. REINVESTMENT RETURN is the growth from the normalized earnings reinvested in the company. It is the retained earnings divided by the accumulated equity. It is the best measure of internally generated growth of earnings, dividends and book value. IR. INHERENT RETURN is the sum of the dividend yield and the growth. PTR. PROJECTED TOTAL RETURN is the product of sum of the RR and YLD times 1 + VR. PB. PAYBACK is the number of years required to payback the stock price from the earnings growing at a rate equal to the IR less inflation. PC. RELATIVE PAYBACK is the stock’s current Payback divided by the median Payback. PC. Is the target relative PB. MPEPS. The earnings used in the calculations are smoothed (MPEPS) (ET>1), or nominal earnings (ET = 1). IEPS. The Implied Earnings per Share required to make the stock neutrally valued at the average of the assigned relative valuation range (for the latter, see under NM). This entry was posted in Guide to the Corequity Analysis on January 1, 2017 by robertlcolbygmailcom. I applaud the majority of the 7 comments above which see stock buybacks programs as seriously flawed. To see how bad stock buybacks compare to investments visit “The Net Profit Test” (https://corequity.blogspot.com/2016_04_01_archive.html) and you will see a graph that compares the annualized returns from buybacks to investments. From the perspective of the Shareholder (vs the share seller), Buyback returns are simple interest vs compounding from investing. CEOs that buyback their company’s shares are admitting that they don’t know how to invest the cash profitably. One would think that would be their most important responsibility. This entry was posted in Buybacks, Comment on articles on December 28, 2016 by robertlcolbygmailcom. Our universe of stocks outperformed the S&P by 4.2% last month while the Undervalued Screen gained 6.5% relative. The Overvalued were equal to the universe’s return of 4.2% mainly due to the superior performance of the Energy stocks which numbered 15 out of 26 in the screen. The Overvalued ended the month on a strong note gaining 2.4% in the last week. This entry was posted in Equity Valuation, Performance on December 1, 2016 by robertlcolbygmailcom.